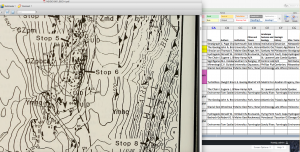 PLACE Project – Jessica M. Parr, Ph.D.
Analyzing Guidebooks from the New England Intercollegiate Geological Conference. This raw information will later be converted to Dublin Core metadata. In June 2016, I was hired to work on the PLACE Project, an IMLS-funded program to build a geospatial interface. The Project, which is now in its third year, will use Fedora Commons and Open Geoportal to ingest approximately 3,000 digital assets from UNH’s digital collections, encode them with Dublin Core and GIS metadata, and allow users to search them by location. PLACE is expected to be a more flexible interface that allows better access to digital collections. The PLACE Project team is interdisciplinary, and includes digital librarians, historians, geographers, and programmers. The digital collections being prepared for ingest include government documents, records of local scholarly organizations, topological maps, and photographs from around New England. When the interface is complete, the interface code will be made freely available to other institutions who want to use it to build their own digital collections. My current responsibilities include assisting with the creation of work flows and identifying new technologies for our toolkit as we produce new digital assets from digitized materials, then analyzing the assets to produce the initial raw information (geographical terms, GIS coordinates, quadrants, keywords, people, etc) that we will use to produce the Dublin Core Metadata. We are currently processing a series of field guidebooks of the New England Intercollegiate Geological Conference (NEIGC) for ingest.